We’re very excited about our upcoming wedding: think A and a new Jurassic Park film, or K discovering an unknown Buster Keaton film, and you’ll get an idea of the level of nervous anticipation we’re in. This website should have all the infomation you need. We can't wait to share the day with you in our lovely London Town! We’re starting at Camden Town Hall (opposite King's Cross St Pancras station), which is where we’ll be tying the knot at 2pm. The venue asks if people can arrive 20 mins early as everyone needs to be seated for the ceremony to begin at 2pm. 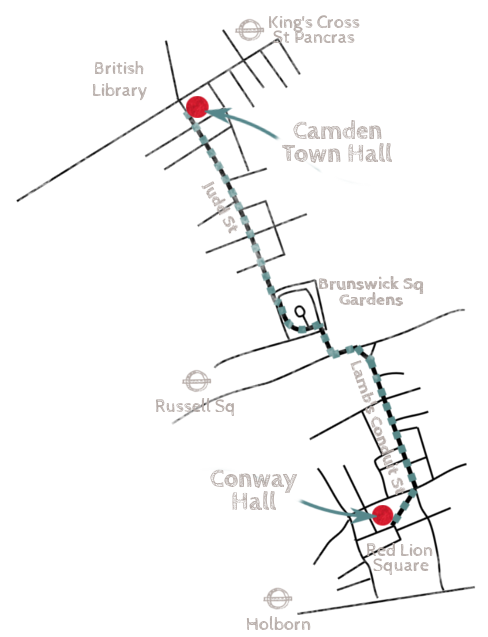 Once betrothed, we’ll be walking to nearby Conway Hall (in Holborn) for food, drink, and general merriment. The start time hopefully allows those living a few hours away to travel up in the morning, and it’ll be finishing in time for people to get the last tube should they need it. We’re under strict instructions that the venue door must be locked upon the stroke of midnight, so if you’re still around in the last hour, expect to be helping us pack down! Please arrive by 1.40 to leave time to find the room. The wedding is not just our show of commitment to each other in front of you, our loved ones, but a thank you for all your support. As we're blessed with so many wonderful people in our lives we’ve ended up maxing out the venues, so expect some chaos and sharing as we set about our 'homemade' wedding day! We're hoping for a fairly relaxed day, with a fair bit of helping yourselves, so don't be too surprised if we throw you a bottle opener, bread knife, or iPod at some stage, or if we ask for a hand to move tables to make extra room for A's special dance moves. We want people to be comfortable, feel special, and look sharp. If you wish to wear a suit or a dress (regardless of your gender), please feel free. But likewise, if you’re going to be more at home in smart-casual attire, that’s brilliant too. We're very flexible, but if you need inspiration, then we love things like waistcoats or braces in lieu of smart jackets, and flatshoes with party dresses are cool. Kilts are most welcome, if that's your thing. Whilst the ceremony and party are both indoors, there’s a short 15-20min walk between them, so you’re best wearing some comfortable shoes for the day and checking the weather forecast! As well as the Groomschildren that we’re borrowing from family and friends, we’re planning the wedding with the young (and young at heart) in mind. Therefore if you have any kids please definitely feel free to bring them should you want. We are fully expecting crying and shrieking during quiet tender moments of the ceremony, and that’s just from the adults! But equally, if you’re after a break from the little dears, by all means leave them being babysat at home. Just let us know either way so we can make sure they're catered for. We suggest you get lunch before the ceremony, and there’s plenty of places nearby (there's even a pub opposite the Town Hall). To fit in with our laid-back, homemade theme, we’re hoping to self-cater quite a lot of it (yes, we know), so please let us know of any dietary requirements in the RSVP, and come expecting a relaxed and communal affair. Rest assured that K and his OCD have all the relevant Food Hygiene certificates! 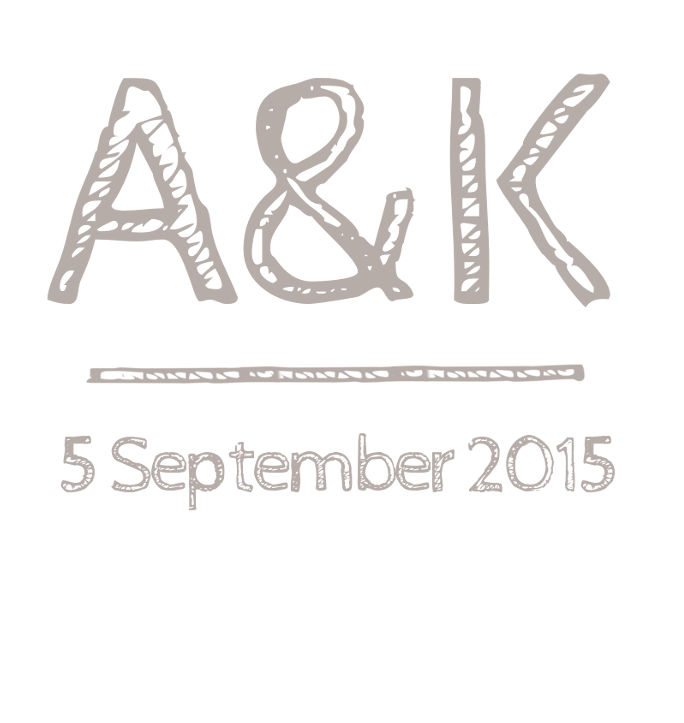 As well as your two Grooms, there will be Groomsmen, Groomettes and a host of wonderful family members helping out. If you’ve got any questions or problems during the day, just ask one of them, and they’ll be able to point you in the right direction. Click here to choose your lunch options for the next day pub lunch. One of the joys of London is that it’s very easy to get to by public transport. If you’re driving in, then you may want to check your hotel has parking, else it can be difficult to find and expensive. Once in London, we recommend Citymapper as a great website and free mobile app for within London directions and transport hints. There are lots of different ways to pay for travel around London (Oyster, contactless cards, paper tickets), just see this page on the TFL website for more details. N.B. The ceremony starts at 2pm, so you might want to enquire about early check in. Travelodge allows check-in at 12pm for £10 fee if you click the early check-in box when booking. For those that insist however, we have decided to ask for either contributions to our Icelandic honeymoon, or to British Sign Language lessons, which we'll be learning together as we start our married life. We hope that you can make it and join our celebration of friends and family. If you could please let us know either way ASAP so we can cater accordingly, that’d be great. To RSVP please click here to open our online form. Other than that, all that remains to be said is we look forward to seeing you soon, and please don’t think you have to wait until the wedding - do get in touch!